The concept aims to integrate the functions of the primary packaging of the shoes with that of a shopping bag, thus reducing the enviromental impact of the overall packaging-system. The package is equipped with a lace that can be extended to allow and facilitate the transport as well as the extraction from the shelves. It is composed of a "shell" and an internal tray-drawer: two elements that make up a system for the protection and storage of the product, and which allow, at a second time, the reuse of the pack at home. 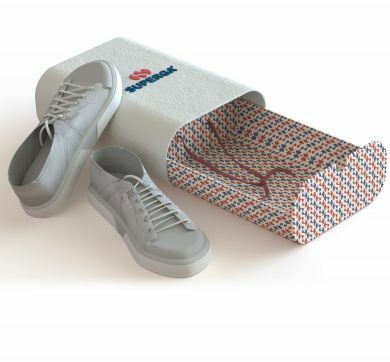 The traditional shape of the shoe box (a parallelepiped box with sharp edges) has been softened by curved surfaces; the only used material has been cellulose pulp (biodegradable material produced by injection moulding) also to obtain a more ergonomic shape. Project developed and selected for the international student competition "Remarkable Packagings & Alternatives" within the "Emballage" packaging exhibition, achieving the second prize (Paris, November 19-22, 2012).